When I was growing up the Gregory’s was the essential street directory in everyone’s glovebox. I can remember feeling car-sick trying to navigate as a passenger while my father drove, turning the book around to know whether it was a right or left turn coming up and my parents heated discussions about missing a particular street and trying to find our way back on track again. This week in our state, the exam results of the final year school students have been released. Much of the media focus is on those students who have achieved the highest marks in their exams, and rightly so. The reality is, however, that we also need to celebrate and affirm all students who follow their passion, set a goal and achieve it, or even surpass it. How do we develop an education system that allows the expression and the celebration of the passions/interests of a diverse group of young people. Providing them with the opportunity to flourish. …to be in their element. …a product or service takes root initially in simple applications at the bottom of the market and then relentlessly moves ‘up market’, eventually displacing established competitors. For each category there are different motivators. It’s easier to inspire disruptive innovation to those on the left, than the right. 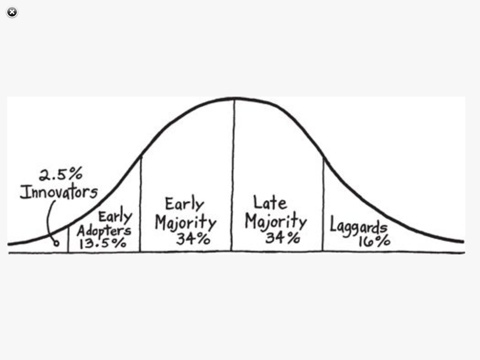 According to Simon Sinek in Start with WHY the key is not to try and appeal to the majority, but gain a groundswell with the innovators and early adopters. Start a movement for change and then appeal to the different motivators of the other segments, not assuming its the same for all. 1. The era of the GPS and digital maps in handheld devices have made the street directory obsolete. 2. GPS and digital maps challenged the status quo. 3. There was quick take up from the early adopters, steady increase in popularity, and now it has become mainstream. However, the laggards are no doubt the ones still hanging onto their Gregory’s. 4. It’s moved ‘up market’ and displaced established competitors. 5. It changed life for the better – no more car sickness from reading maps, no need to turn the book around when turning corners and preserving marital relationships. 1. School education as we know it will become obsolete. 2. The alternative will challenge the status quo. 3. A different approach to bringing change will be required for the segments, no one size fits all and there will be resistance to change. 4. Many of us are already part of a groundswell for change, gradually displacing industrial-era thinking. 5. It will change the experience of school and learning for the better, for so many young people. Imagine you and I having this conversation in 10 years time, reflecting on the changes that had occurred in school education over the last decade. We laugh as we reminisce and comment, “it’s almost unrecognisable now”.